Chocolate babka, I love you. For those who have never heard of it, babka is an Eastern European Jewish yeast bread dessert, typically filled with chocolate and/or cinnamon. If it’s in my vicinity, I will sense it’s presence and it won’t be there for long. Now when it comes to the perfect babka, I have standards. Firstly, it should not be ‘bready’, I need the layers to be tight and thin. I enjoy gently peeling off each tender layer, one at a time, welcoming more chocolate goodness. Secondly, it must be made with dark or semi-sweet chocolate. 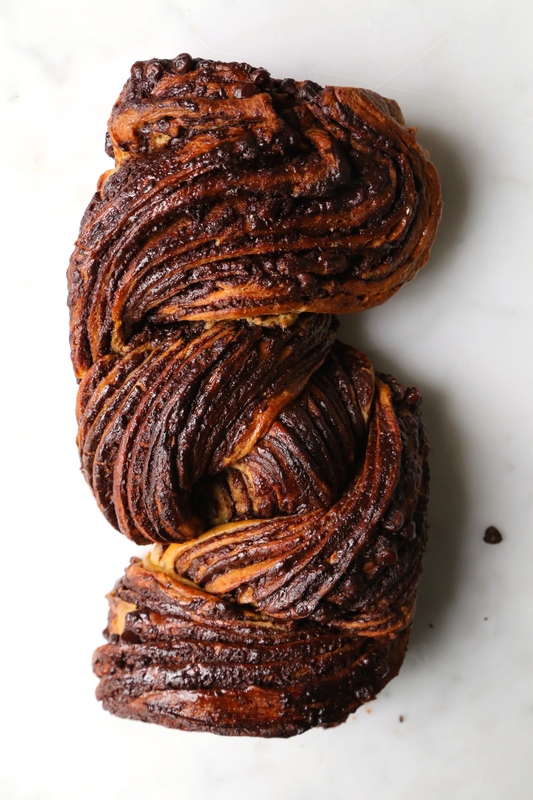 Offer me a milk chocolate or nutella babka and I will look the other way. I do enjoy a nice cinnamon babka but I will never choose it over a chocolate one. Here in NYC, I recently discovered the best chocolate babka I’ve ever had. Thank you Green’s Home Style from Brooklyn. You want a religious experience? Eat this babka. If you are living or visiting NYC, I highly recommend hunting it down. I purchase mine from Murrays Bagels. Breads Bakery also comes highly recommended by New Yorkers, but I’d only send you there if you like a bready babka made with the option of nutella. If you want the good stuff find the Greens. Now, you are probably thinking to yourself if Green’s is this good, why am I reading a blog post for another babka option? To put it simply, I wanted to offer myself and you a healthier yet still delicious version of babka. That way I wouldn’t feel as guilty eating it for breakfast, as a snack, and dessert. My babka recipe uses ivory/white whole wheat flour. I didn’t know what this was until a week ago, but voila, it’s flour that uses hard white wheat berries instead of hard red wheat berries. White refined flour and regular whole wheat flour are both made out of red wheat berries. Fortunately white whole wheat flour is lighter, milder, sweeter, and less nutty than whole wheat flour. Therefore, this recipe is a more nutritious and has more fibre than your average babka but doesn’t have that whole wheat flavour. I used honey instead of sugar for it’s unique flavour and as an alternative to refined sugar. It’s a bit healthier option but lets not forget the chocolate has a fare share of sugar in it. Let’s just saying I’m trying my best to include whole ingredients without ruining the babka experience. Lastly, I want to mention this is my first recipe that uses butter or any kind of dairy for that matter. I decided to offer recipes that use dairy because I didn’t want to limit what I could make. Although more expensive, I recommend purchasing organic pasture butter. It’s from cows that get to go outside and graze on grass. It’s better for the animal, the environment, and for you. Happy Hanukah to those who celebrate and hope you make this delicious yeast cake! A healthier chocolate babka using white whole wheat flour and honey. Combine warm milk, sugar, and dry yeast in a small bowl. Give it a quick whisk and let sit for 5 minutes, until foamy. In a medium bowl, whisk egg, egg yolk, and honey until combined. Whisk in the yeast mixture. In a bowl of an electric mixture fitted with a paddle attachment, mix together flour and salt. Pour in the egg yeast mixture and beat on low until combined. Switch to the dough hook and add the butter. Beat on medium-low until butter is incorporated, about 8-10 minutes. Dough should be smooth and slightly sticky. Finish the dough by hand, turn out dough onto a lightly floured surface and knead a few times until very smooth. In a large bowl, whisk together flour and salt. Add the egg yeast mixture and stir until combined. In the bowl, knead in the butter. Once roughly combined, about 1 minute, transfer dough to a lightly floured surface and continue to knead for 15 minutes. Finished dough should be smooth and slightly sticky. (The dough will start off very sticky but will become manageable after kneading, be patient). Form dough into a smooth ball and transfer to a large, lightly buttered or oiled bowl. Cover with plastic wrap and let rise in fridge overnight, or for at least 6 hours. Lightly grease a 9 x 5 loaf pan; set aside. Prepare the filling. Combine the chocolate, cocoa, butter, honey, cinnamon, and sea salt in a heatproof bowl set over a saucepan of simmering water. Stir occasionally until chocolate and butter is melted and mixture is smooth. Remove from heat and keep bowl over saucepan while rolling out the dough. Place the chilled dough onto a clean and lightly floured surface. Roll out to a 13 x 22 inch rectangle. Using an offset spatula spread the chocolate filling evenly over the entire surface of the dough. As an option, sprinkle mini chocolate chips. Carefully and tightly roll the dough from the shorter length to the other shorter length. The tighter your roll out the thinner the babka layers will be. Trim the ends of the log, about 1/2". Cut the log in half lengthwise. Gently twist the two pieces over each other, keeping the exposed layers face-up. Carefully transfer the babka to the prepared loaf pan. Cover, and let rise in a warm place for 90 minutes. While the dough is rising, preheat the oven to 350°F, and make the syrup. Combine honey, vanilla extract, and water in a small saucepan over medium heat and stir until honey dissolves. Remove from heat and set aside. Prepare an egg wash by whisking together the egg and 1 tablespoon of water. Gently brush on top of babka (you will not need all of it). Bake for 45-50 minutes. Remove babka from oven and immediately pour syrup evenly over the loaf. Transfer pan to a wire rack and let cool in pan for 15 minutes. Turn babka onto a rack and allow to cool completely before slicing. This entry was posted in Dessert and tagged babka, baked goods, bread, cake, celebration, dessert, holidays, honey, sweets, white whole wheat, yeast. Bookmark the permalink.